In this example the service provider network is running a full mesh of MPLS-TE tunnels (although no constraints have been configured in this example, they are simply following the IGP shortest path). The customer provides and manages their own CPEs for their L3 VPN and want so stretch layer 2 VLANs between two sites (with dual CPEs and switches) by configuring L2TPv3 tunnels between their own CPEs. 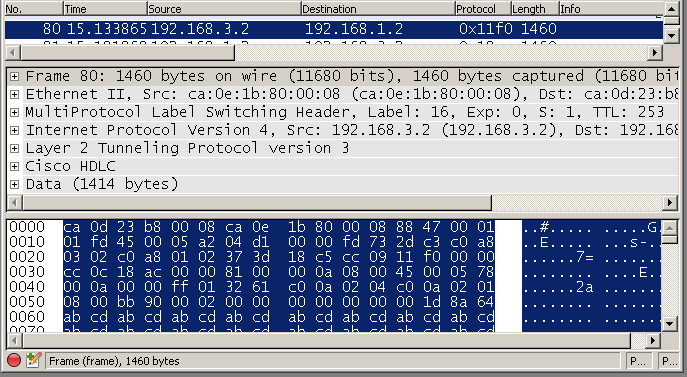 The customer has created an L2TPv3 pseudowire between CPE1 and CPE3 which connects trunk interfaces on SW1 and SW3 and another L2TPv3 pseudowire between CPE2 and CPE4 connecting trunk interfaces on SW2 and SW4. However STP is configured for both test VLANs (10 and 20) to prevent layer 2 loops and within VLAN 10 SW4 is blocking the link to SW2 (which is actually the CPE1 to CPE3 pseudowire) and within VLAN 20 SW3 is blocking the link to SW1 (with is actually the CPE2 to CPE4 pseudowire). To accommodate this the service provider has nailed up two static MPLS-TE tunnels that specifically route traffic for this customer's VRF around two differ paths on the network. The pseudowire between CPE1 and CPE3 always routes along the explicit path PE1 <-> PE2. 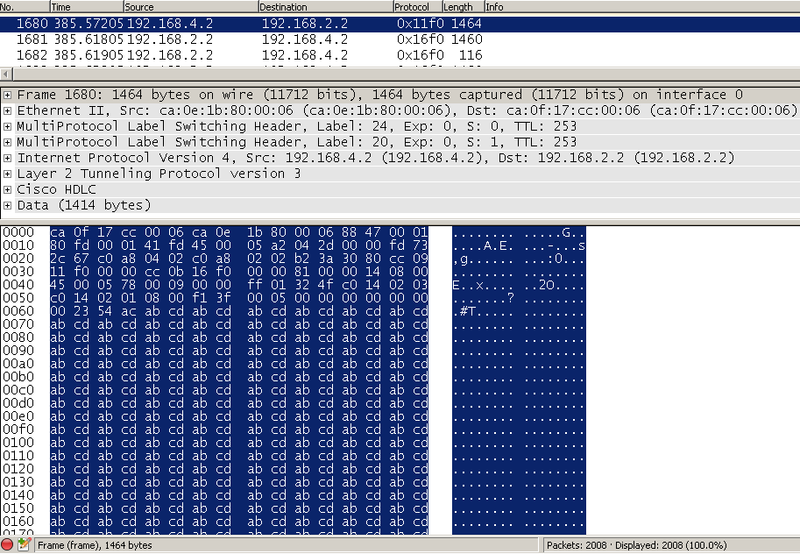 The pseudowire between CPE2 and CPE4 always routes along the explicit path PE4 <-> PE3 <-> PE2. LAN facing interfaces on the CPEs only need support 1500 byte MTU, layer 2 headers are excluded, even when a VLAN tag is included this doesn't need to be acommodated for. WAN facing interfaces on the customer routers (and thus CPE facing interfaces on PE's) need to support an MTU of 1518 + 20 (IPv4) + 4 (L2TPv3) = 1542. PE to PE interfaces need to support 1542 + 2x MPLS labels = 1550 octets. *>i 192.168.1.0/30   192.168.12.1             0    100      0 ? *>i 192.168.2.0/30   192.168.42.4             0    100      0 ? *   192.168.3.0/30   192.168.3.2              0             0 65001 ? *>                   0.0.0.0                  0         32768 ? *   192.168.4.0/30   192.168.4.2              0             0 65001 ?